After mentioning Sam Peffer and his sad demise this month I was pointed in the direction of a photo of him in “British Film Poster” by Sim Branaghan. 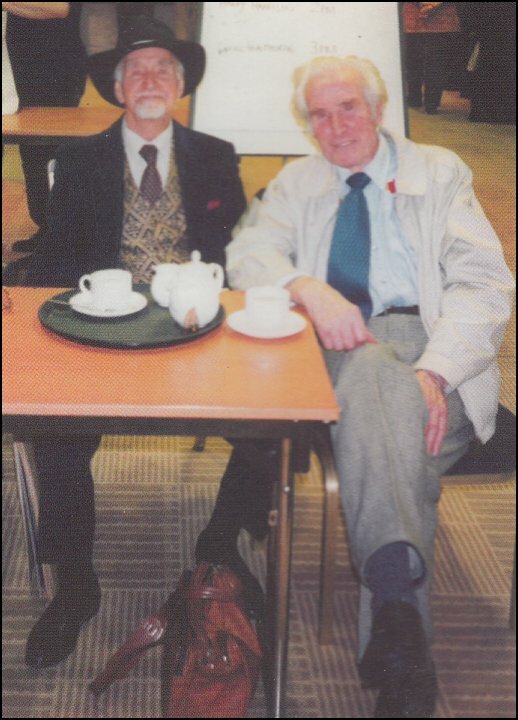 He is shown at a book fair in London in 2005 along with another gentleman in a hat. I was particularly pleased to see this as it was a name I know well but had never seen a picture of him. If you want to know who it is click on the photo. You wait for months for one and then two come along at once. 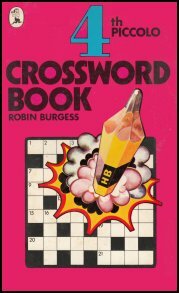 I managed to get hold of 7th Piccolo Crosswords Book last week and this week the 4th. So next week it will be number 11 and then number 12 – if only! I was very sorry to read in ‘The Times’ an obituary of Sam ‘PEFF’ Peffer, the prolific PAN book cover artist. 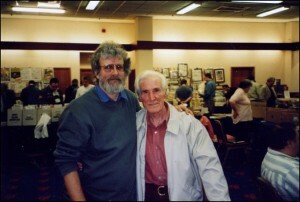 I met him on several occasions and he was always happy to talk about his time at PAN and other publishers. I have one piece of original artwork plus numerous signed books. Click on the photo to see the artwork. 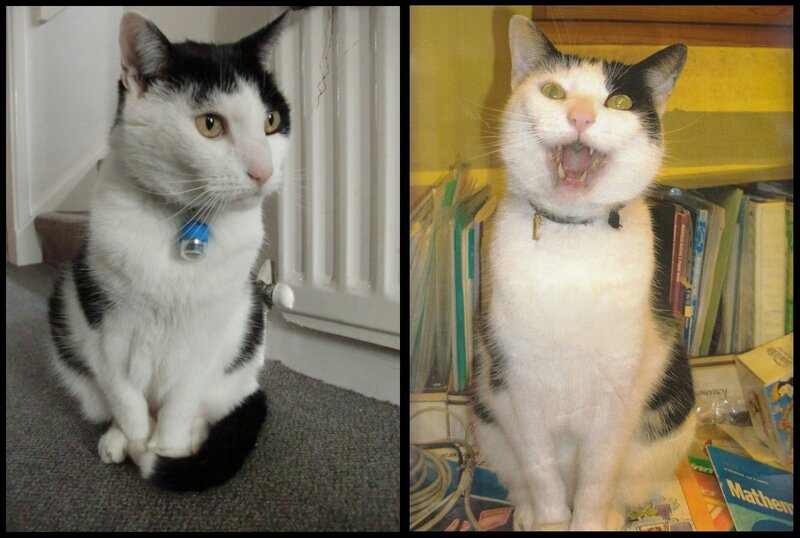 Sadly last Tuesday we had to have our cat, Moxley, put to sleep. He suddenly went down with saddle thrombosis and the prognosis was not good. He was the same age as my website and was probably on my lap while I inputted at least 90% of the contents. It was our daily routine so I dedicate this site to his memory, a friend and companion. As I look out the window I can see his grave alongside the other seven much loved and sadly missed family pets from over the last 38 years. On a more upbeat note I have been contacted by a cover artist who did at least 14 covers for PAN in the 50’s and many others for different publishers. I am waiting for some photos and hopefully can name names next week. It makes such a change for someone to come to me rather than me badgering them! I’ve also managed to get one step closer to getting a full set of the Piccolo Junior Crossword books unlike the PAN editions! I often check the numbers I am missing and number 7 was elusive until now when suddenly two copies become available! I recently picked up a copy of “Young Claudia” number 528 in the DELL Mapbacks series which looks as though it has never been read. It was the cover which caught my attention as it is certainly more eye catching than the covers from PAN. I sorted out the other titles published by PAN, rescanned them and put them on a page along with the DELL cover. I’m left wondering why PAN only published 7 of the 9 titles in the series. Number 8 was ‘The Antic Years’ and number 9 was ‘Return Of Claudia’ There were a couple of other titles but these were omnibus editions. Going back a few blogs where I mentioned recycled artwork, I heard from Uilke in The Netherlands who pointed me in the direction of another one ( his site is well worth visiting for his extensive collection of paperback covers) It is from Ullstein Bucher and is Hodder not PAN related this time. You’ll noticed it has been flipped as the signature is backwards. 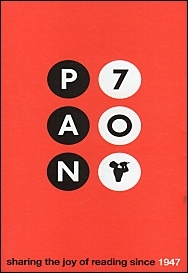 In 1971 PAN brought out a set of six ‘mini books’ (approximately 5″ x 5″) written by the ‘Peter Pan’ of cooks Robert Carrier. 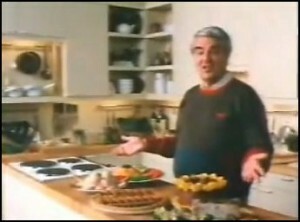 The six books gave suggestions for suppers, luncheons, barbecues, breakfasts/brunches, dinners and children’s parties. I have often seen individual titles for sale but I’ve only just acquired the set in a slip case. Click on the picture of Robert Carrier to go to his page. Sorry for another short posting but my iritis has returned after an absence of twenty years so the world is currently a haze while I have to keep putting drops in my eyes.